Meet Andy Gordon, a health care litigator, dad, husband, cyclist, philanthropist and one in 14 million. It was Labor Day 2009 when Andy received the same diagnosis his wife had heard 12 years earlier — a one in 14 million possibility. Andy’s wife Sue was diagnosed on April 11, 1997, with multiple myeloma, and she died on May 1. She never came out of the hospital. Their kids were 12 and 14 at the time. Multiple myeloma is a blood cancer that forms in a type of white blood cell called a plasma cell. Plasma cells help you fight infections by making antibodies that recognize and attack germs. Multiple myeloma causes cancer cells to accumulate in the bone marrow, where they crowd out healthy blood cells. 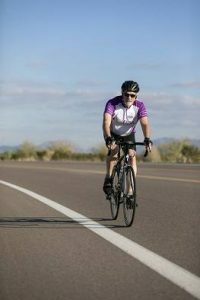 “I was living in Washington, D.C., and riding my bike a fair amount when I started to have back pain,” recalls Andy. “I thought it was just middle-aged stuff.” The pain became unbearable while he was in Guantanamo Bay, Cuba, working for the U.S. Department of Homeland Security. In and out of planes and boats, he chalked it up to his activity, but he scheduled an appointment when he returned to the states just to make sure. When the doctor couldn’t figure out the source of the pain, she sent Andy for a CAT scan. “I could tell just from the look on her face this is not going to be terrific news,” Andy says. The doctor told Andy he needed to be hospitalized immediately. Andy had just turned 60 when an oncologist in the Washington, D.C., area confirmed he had multiple myeloma. Andy began chemotherapy right away. “I knew the most important thing for me was for my kids to know that what happened to their mom was not going to happen to me,” Andy declares. Three months before his diagnosis Andy married Patti Evans, a friend he had known for years. “If you get sick, you want Patti on your team,” he says. Patti was caring for her ailing father in Phoenix and was unable to fly to Washington while Andy was undergoing chemotherapy, so instead she secretly called friends and asked them to visit him. “Patti’s just one of those people who is a problem solver. When you’re facing a cancer for which there’s no cure, that’s particularly important,” Andy says. The chemotherapy was working, and Andy’s cancer was decreasing enough to make him a candidate for a stem cell transplant. On the advice of his physician in Washington, Patti and Andy began to look for a medical center where he would get the transplant. They had consultations with several top medical centers in the U.S., but found their reputations to be different than what he experienced as a patient. 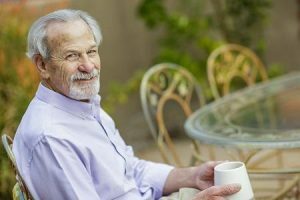 “I can close my eyes and actually see our first visit to Mayo Clinic and my initial interview with Joe — the sense was completely different than what I’d gotten from some of these other places,” Andy emotionally recalls. Joseph R. Mikhael, M.D., is a hematologist at Mayo Clinic in Arizona. He has conducted extensive research on multiple myeloma and is one of the world’s foremost leaders on the disease. The revolution in multiple myeloma over the past two decades means patients today like Andy are living healthier lives. Multiple myeloma research has evolved incredibly over the last 10 to 15 years. Today there are new approaches, drugs and transplants that can be used to bring multiple myeloma into remission. In 1997, when Sue Gordon was diagnosed, the use of combining chemotherapy drugs was just in the experimental stages. The revolution in multiple myeloma over the past two decades has been fueled by giant leaps in the understanding of its pathogenesis and the development of several novel agents. Today, patients like Andy are living healthier lives, and overall survival has doubled. Because multiple myeloma is a complex and wide-ranging disorder, it must be managed individually based on multiple interacting disease- and patient-related factors. Mayo Clinic was instrumental in the development of carfilzomib and pomalidomide, two new drugs approved by the U.S. Food and Drug Administration for multiple myeloma in 2012. The last time the federal agency approved a novel myeloma therapy was in 2006. This approval was based primarily on the results of a large Mayo-led clinical trial that took place at multiple centers across the U.S.
Andy underwent a combination of high-dose chemotherapy and an autologous stem cell transplant, which means his own stem cells were used. Andy stayed in remission for more than four years. “I got on with my life. I went back to work and back to riding. I wanted to do something to help find a cure for blood cancers. That’s why I got involved in the Arizona Chapter of the Leukemia and Lymphoma Society,” Andy says. He raised more than $150,000 through cycling fundraisers. Mayo Clinic’s Arizona campus has received grant funds from the Leukemia and Lymphoma Society, which provides research funds to organizations to find cures for blood cancer. During those four years, multiple myeloma treatments continued to improve. Dr. Mikhael relied on a similar chemotherapy treatment and a second autologous stem cell transplant, putting Andy into a deep remission. One year after the second transplant, Andy got back on his bike and completed a 100-mile ride around Lake Tahoe. And he’s back to working as an attorney and professor at Arizona State University Sandra Day O’Connor College of Law. Hi Andy, I had a stem cell transplant in February of 2017. I feel pretty good, however, I am waiting for the other shoe to drop. I did not produce enough cells to have another transplant. I am stage 3. Dear Andy, I am made more hopeful by your story. I'm 67, and an about to retire trial attorney; diagnosed Stage 1 in June and undergoing a stem cell transplant in January. I'm an avid exerciser and golfer and hoping to continue both after the transplant. Your bike riding is the first encouragement I've had about exercise. Editor’s Note: @pgielen Thank you for reading the blog. So glad that Andy's story provided some hope and inspiration. Best wishes to you during this journey.